I had never been to this venue in Malmo before but it is a really great place and really cool people hang out there. I met up with Steve from Big Elf and Pär and Eduardo from Sgt. Sunshine. I showed up early and hung out with the guys from Bland Bladen. They were setting up for soundcheck when I got there. I brought a copy of the recording I made of Mother Superior from Loppen in Christiania back in Sept. 1998 for the guys from Snuffed by the Yakuza, as the band has two ex-members of Mother Superior and Silvi (a local who drives tour busses now) also used to play with them. After some food and beer, etc. I got with the two brothers (drum and bass) from Snuffed over to Dave's (bass player in Bland Bladen, who used to play with these guys up in Upssala) place to relax for an hour or so. We just chatted watched some weightlifting championships on the TV and listened to music. The rest of Bland Bladen showed up and after 20 minutes we headed back to the club. I was surprised that at 10:30 there were still very few people here. We wait until nearly 12:15 before Snuffed start and now there must be 150 people. Wow, what a change. They opened with a very raw number, sort of like an old dirty blues number but played in a more punk rock style. 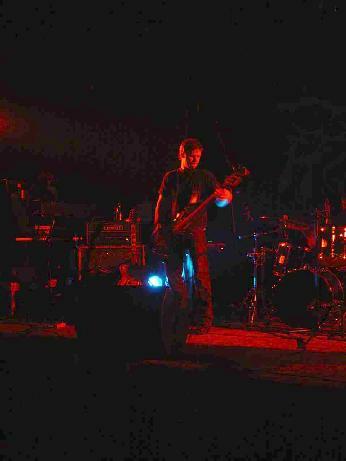 Then the band as a 3 piece (Ex. Mother Superior singer) blasts through 6 songs, full on punk rock, before the second guitar player (also used to play in MS) joins. Now the sound becomes much more hard driving ROCK-Punk. The crowd like it quite a bit. It is really a very mixed crowd of young folks. Silvi, who also used to play in Mother Superior comes out full on rock star mode and plays a wild guitar solo before the band play a couple of old Mother Superior tracks. A short potent set of 14 songs in 40 minutes. Fun stuff. After about 45 minutes (1:30) Bland Bladen finally hit the stage. There is still a very dedicated crowd here and the new fluorescent backdrop looks really great. The band opens with a new short intro like song, "Flarörn". I have to start by saying that the sound was just fantastic this night. Also, there was a full team of people there videotaping the whole event on 5 cameras. The intro track has a really nice synth lead that sounds like a flute to begin with before building up. The guitar riff reminds me of old GONG during the heavy part. Next up is "I Grevens Tid" from the bands CD. This begins with the delay wah guitar that is a bit like Dissolution by the Ozrics but the song is not as frantic as the Ozrics. This features amazing playing by the entire band. There is a b section that the band screw up the segue and this bothers them a lot but Anders, the drummer, lost the guitar in the monitor and could not hear anything. Minor things. The people really get into "Daggväta" with the faster pace. This is such a great piece of music that showcases all the talents of this band, with the great bass playing, drumming, lead guitar work and electric piano and synth work of Olä. 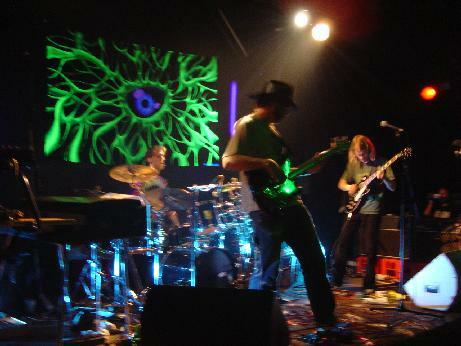 This track is very Ozric Tentacles inspired at times and very jazzy. "På Grön Kvist" is next and slows things down as we go into a reggae groove before the song builds up and up. "I Afton Trans" follows and is the start of 3 long tracks all over 10 minutes and the new one over 15! This songs features some great wah guitar and interplay between Olä and Seb on guitar. They seem to play this track a little fast at times. "Härolden", the next brand new song, is perhaps the best the band have ever written and also the heaviest. It starts very slow and spaced out before really building up. The end has this really great trance techno synth line that the band really rocks hard into. Amazing stuff! The set ends with "Dimland", with its very characteristic synth line that all the people recognize, before the band launch off into space for the last time on this night. Amazing but very late night. It is so great to see so many people coming out for space rock!